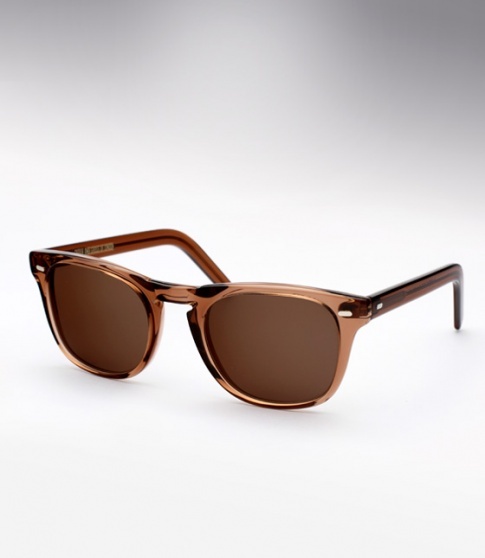 Cutler and Gross 1032 - Cola Need Help? It's all in the details and the execution. The Cutler and Gross 1032 is a timeless style done to perfection; from the workmanship to the sizing and proportions which tends to fit virtually everyone who puts it on. The 1032 is one of those versatile pieces that can be worn any time, either dressed up or down. It features Italian acetate, a classic keyhole bridge, and vintage oval shaped pins which offer a subtle nostalgic touch. It is handmade and hand polished with hand drilled riveted hinges. Offered here in the very cool and unique "cola" colorway with dark brown lenses.